Marvin the Mouse has a cold. This causes quite a problem for all those around him, especially for Marigold, his next-door neighbour. 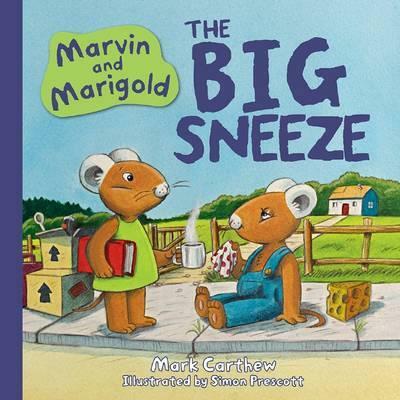 Marvin’s sneezes cause everything in Marigold’s house to clatter and crumble. So Marigold needs to come up with a solution. And quickly, before Marvin leaves. The Big Sneeze is a delightful story told in lyrical rhyme. Although there are perhaps, more words than many picture books for this age, it is so rhythmic and fun to read aloud it’s hardly noticeable. The light-heartedness and meter of the words had me almost singing each page. She built her house strong. With a bed made of feathers and sticks. The illustrations match this bright, breezy, funny story. With the cracks and crumbles in everything around the two mice, the mice’s attire and the occasional subtle detail – like a cat’s tail glimpsed though a window – the pictures add to the enjoyment and comprehension of the story being told. And the twist at the end is told wholly by the illustration. This is a picture book full of appeal and well suited to four to eight year olds. Older readers will also gain enjoyment from reading it aloud to their younger audience.